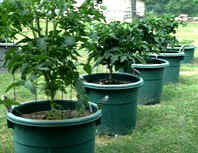 Vines and Roses in Containers Many vegetables can be grown successfully in containers. 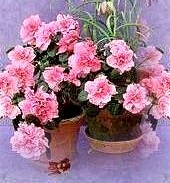 Select a container large enough to hold the plants and accommodate their root systems. Plastic or clay pots, old pails, bushel baskets, old washtubs or sinks, wooden planters or hanging baskets will hold vegetable plants. 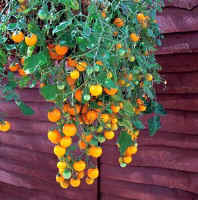 Large hanging baskets are great for cherry tomatoes and strawberries. Treated wood is NOT recommended for growing food crops in containers as the chemicals leech into the soil and then into the plants. Ensure there is good drainage from the container - drill four or more 1/4 holes evenly spaced around the bottom of the container. A one-half inch of coarse gravel at the bottom will help with drainage too. Six to ten inch diameter pots are satisfactory for chives, parsley, herbs or miniature tomato plants. Most tomatoes, peppers, eggplants, etc. will require a 3-5 gallon container. Here are some container sizes for vegetables. Here are some of the best varieties of popular vegetables for growing in containers.